Before covering our top bar hive, I’ll begin with some changes to our two langs, and finish with some pictures of wild bees around our yard. Our Langstroth hives have a story to share as well. As you may recall, Jupiter (the middle hive) is doing well now that the new queen has settled in. We were going away for a few days so I added a new box to this hive to make sure they didn’t run out of space. While I had 8 frames assembled, I had only three foundation sheets left. 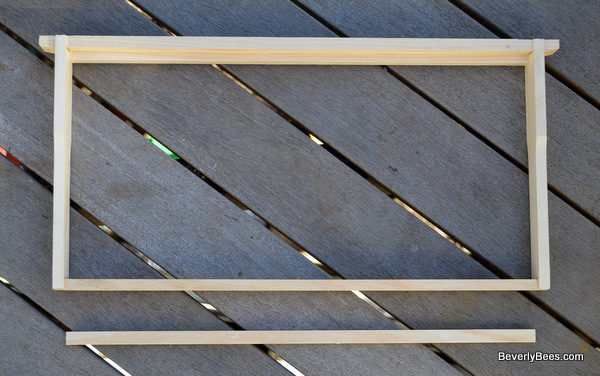 As you probably know, a frame is assembled from four pieces, with a strip of wood called a wedge cleat used to hold a sheet of wax foundation in place. The picture here is from a post by Beverly Bees on how to assemble a frame. Undaunted, I used the three foundation I had and turned the cleats sideways in the remaining five frames. A sideways cleat creates a bar to guide the bees on where to attach comb within the foundationless frame. 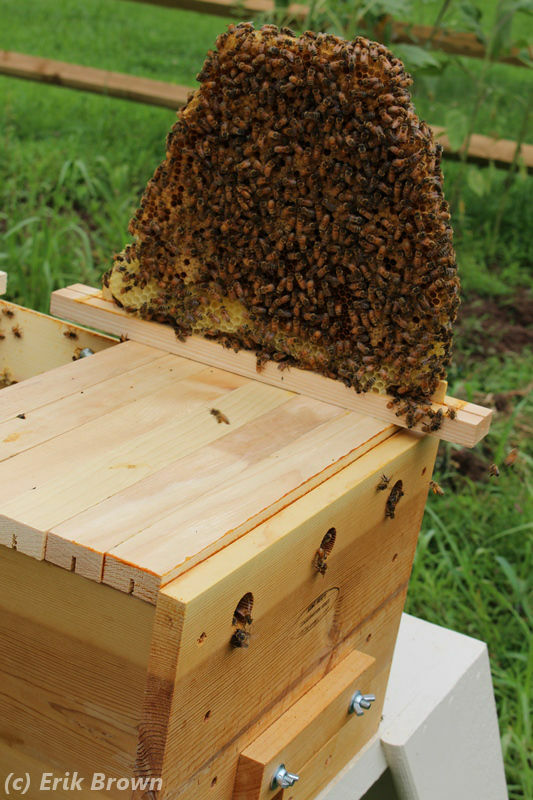 It works in my top bar hive, so why not here…. Out in the bee yard, I stole a frame of honey and two outside frames from the top box of Mars. This hive received a frame of eggs and larva from Jupiter during my last visit, so I considered this payback. This allowed me to add three foundationless frames to Mars, two on each end and one between two frames of honey. Sandwiching the frame between two honey frames should encourage the bees to build the comb straight between them. I then added an 8-frame medium box to Jupiter, using my one honey frame (in the middle), the two remaining foundationless frames (on the outsides), and five foundation frames (everywhere else). Whew! I know summer is coming and the bees might not build a lot of new comb without some encouragement, but it makes me feel better. While some queen troubles have appeared in my Langstroth boxes, our top bar hive (Venus) has been ticking away. My inspection on June 25 was momentous in multiple ways. It was my first inspection where my smoker didn’t go out, which is reason enough to celebrate. Normally at the end of my inspections the bees are getting cranky, the smoke is gone, and I rush to close up the hive. No this time! The smoker smoked, the bees calmly worked, and I inspected. It was balmy 84 degrees with a slight breeze and 63% humidity. Pretty good bee inspection weather, as it turned out. It was the first time in at least six weeks I made it through every frame in the hive. I even had time for some pictures, as you can see. The natural comb of our top bar hive, showing bees and larva among some capped brood. Traffic was heavy, pollen was arriving, and I found 17 frames of bees. Of these, ten of them were heavy with brood (yes, 10 frames! ), 3 were empty or with little brood, 2 were a build-in-progress, and one was full of honey. So the hive is pretty active and the queen Beezus had been busy. One drawback, of course, is that there is not much honey stored away, which does not bode well for winter survival. With bucketfuls of rain falling in recent weeks, hopefully the bees will continue to find nectar and store some honey away. Foraging will likely dry up later in July if the rain stops and it stays warm, though, so I plan to start feeding them again this coming weekend. 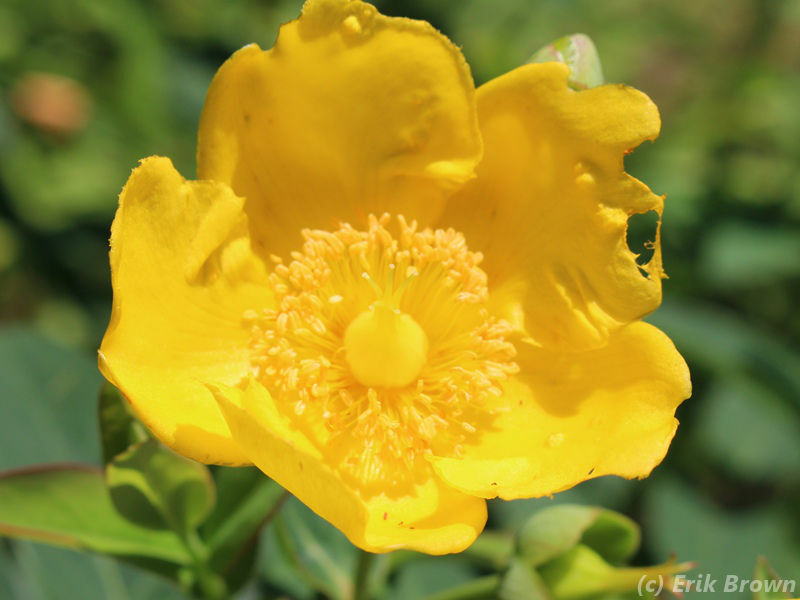 Given all our rain, the plants in our yard have been very happy and the native pollinators are out in force. I’ve been trying to capture pictures of both flowers and bees, so I thought I would share a few here. Enjoy. 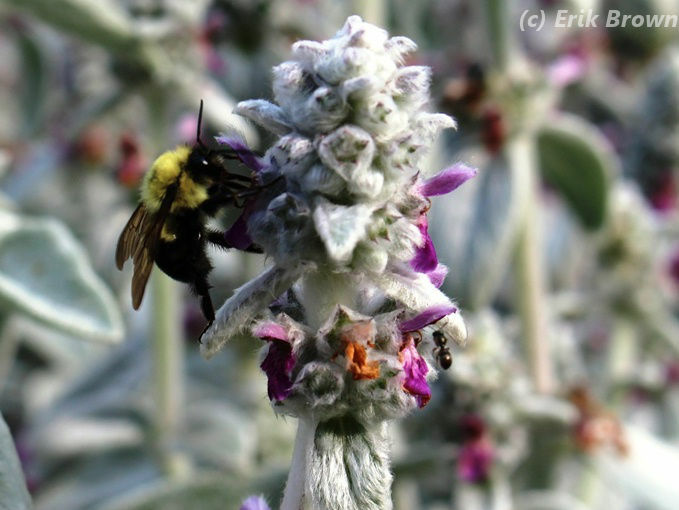 Our lamb’s ear have been covered with two-spotted bumble bees these past few weeks. Visitors to an oregano flower. 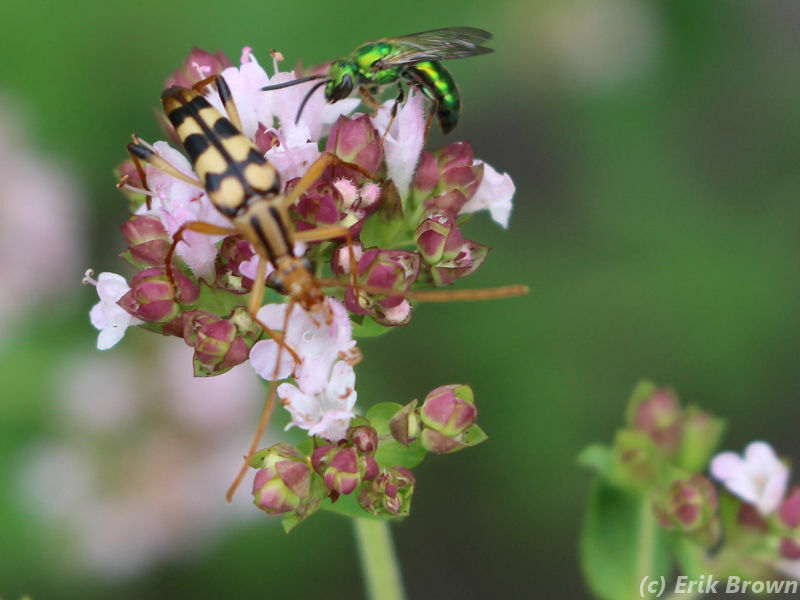 I believe these are an Augochlora Sweat Bee and a Banded Longhorn Beetle (Typocerus velutinus). 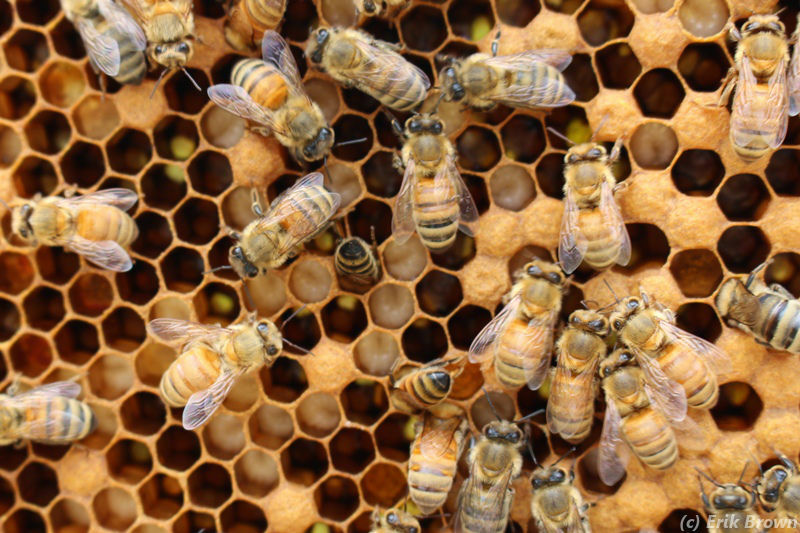 Societies often view the bee and beehive as a model of efficiency. The female worker bee is the standout, of course, as opposed the lazy male drones. It was a while before early civilizations realized that the workers were females and the drones were males, and then perhaps the beehive as a model for society became less appealing to mostly male leaders. Given the ongoing industry of our top bar hive, it seems an appropriate title to discuss their busy progress. BEWARE! Inserting bars (or foundationless frames) between HONEY bars doesn’t lead them to build a nee comb most of the time. It does between brood bars but if you use foundation in the rest of the hive they will make predominantly drone brood. Inserting empty bars between honey bars often causing them to build the honey bars out wider as this takes less effort they building a whole new comb. Always add new bars to the edge of the brood nest or two bars in if you want to expand the brood nest. Thanks, Dewey. I’m definitely making some of this up as I go along. I’m hoping to peek in tomorrow to see how they’re doing and will think about rearranging. Appreciate the insight. I have been making stuff up since day one and I definately learnt my lesson with that one. I am making mistakes all the time, luckily they are mostly result in my inconvenience rather than the bees detriment. Dewey, well you were more than right. I looked in on Sunday and found exactly what you described. The surrounding honey comb was expanded and the foundationless frame ignored. I moved the frame to the end and left the honey frames as best I could. Thanks for the tip! No problem. Once you know they do this you can take advantage of it and save them the effort of building whole new combs to store more honey.